I have been the art director for Learning Fundamentals since 1994. We produce software for language, learning, and speech. We are a small company, which means I am artist, graphic designer, web designer, photographer, photo editor, writer, editor, researcher, and often more than one of those on a particular project or day. 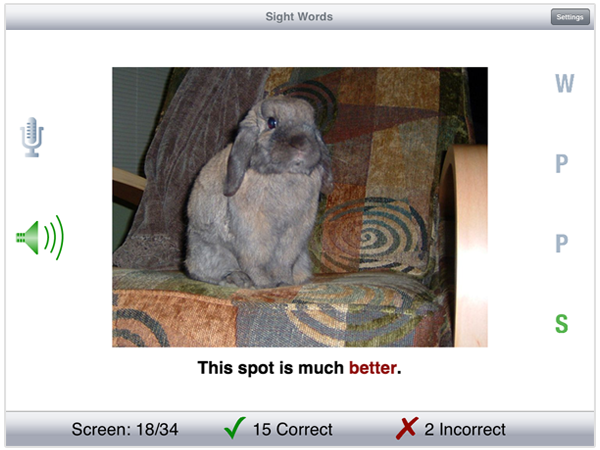 This is a screenshot from my project, Sight Words. The project was originally a DVD. I created videos and graphics, designed the screen layout, created navigation buttons, and edited and formated the photos. We recently repackaged the content as an app. I designed the screen layout, the navigation buttons, and the game icon. The screen design may seem simple, but that is intentional. A distraction-free screen makes it easier for the client to focus on the content. I also created graphics and a downloadable wordlist for the Learning Fundamentals website. When the project was completed, I became the QA person. I proofed the instructions, then I whacked at the app to see if I could break it. Click here to see the other apps that I authored.